The onset of the financial crisis in 2008 has seen a paradigm shift in the investment behaviour of European energy companies. An urgency to build pan-European portfolios and national champions has given way to capex reduction, asset divestment and a refocusing on core business as the harsh realities of an ongoing balance sheet recession have set in. This change in behaviour sits uncomfortably with the vast sums of investment required across European energy markets this decade, a factor that policy makers have been slow to recognise. As a second European credit crunch looms, access to capital is set to become a defining feature of the evolution of European power and gas markets. A key factor driving the change in company investment behaviour has been the tightening in access to external sources of capital, as balance sheet deleveraging has taken hold and credit risk has been re-priced. European bank lending has never fully recovered from the onset of the financial crisis in 2008, although energy market and infrastructure investment has fared better than many other sectors. But European banks are in the process of taking a savage hit, firstly from regulatory driven requirements to increase capital holdings and secondly from falls in the market value of the capital they currently hold (particularly sovereign debt). 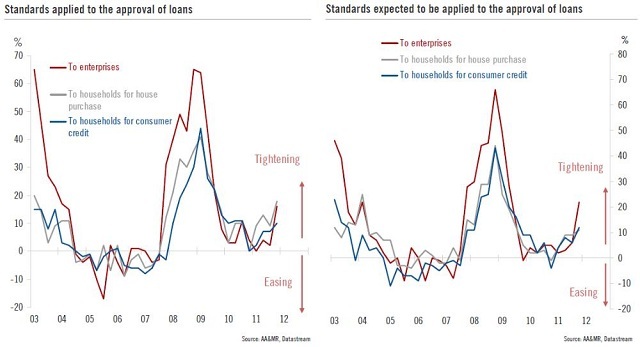 The impact of capital constraints on bank lending is illustrated by the sharp increase in actual and expected loan standards applied to enterprises in Chart 1, an excerpt from a recent report on the impact of eurozone debt crisis by Swiss private bank Pictet. The turmoil in sovereign debt markets over the last few weeks suggests it is very likely Europe is heading for a second credit crunch (see here for a useful summary of the drivers). The tightening in bank lending standards comes at the same time that energy companies are firmly focused on reigning in investment capex. There is a considerable lead time for capex reduction given the forward nature of investment project commitments. But the intent of Europe’s large energy companies to reduce investment capex spend is clear in the message they are sending to their shareholders and creditors. Chart 2 illustrates this trend using a slide from a recent RWE investor presentation. RWE investment capex is currently around €5.5bn a year on top of a ‘business as usual’ capex spend of around €2bn. 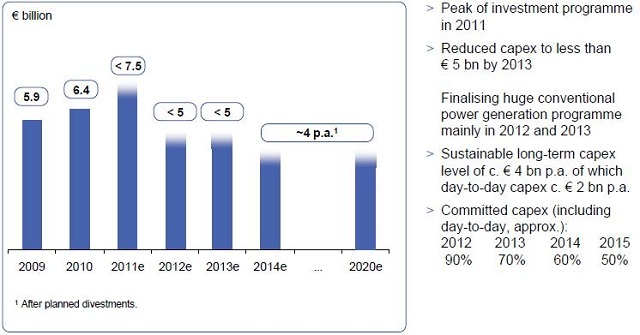 But RWE is targeting a reduction in investment capex in the order of 60% to €2bn by 2014. Of the other Northern European energy giants, E.ON and Vattenfall are sending a similar message of targeted capex reductions to investors. In contrast EDF is projecting capex growth, driven by the enormous investment requirements for their existing and new nuclear fleet, but in the context of a clear message of debt reduction and increase in investment hurdle rates. In this environment all energy companies will require much stronger investment project risk/return characteristics for capital spend approval. Reductions in debt levels and investment capex are driven to a large extent by a fear of the impact of credit rating downgrades on cost of and access to capital. 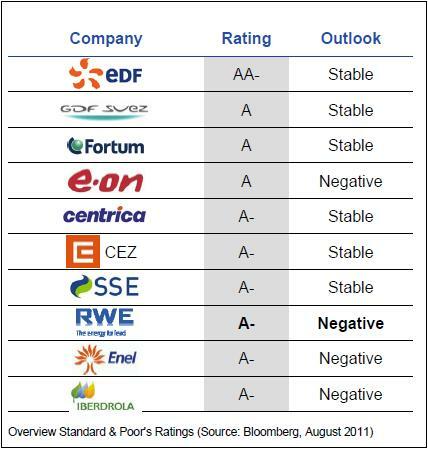 As RWE points out, at the peak of the financial market crisis only companies with a solid “A” rating had access to the capital markets. Table 1 shows that there are not many of the large European energy companies that still meet this criteria. Most of Europe’s smaller companies are clearly much more vulnerable. The scale of the infrastructure investment challenge facing European energy markets is a well discussed topic. Vast sums of investment are required to replace ageing infrastructure and to support the transition to decarbonisation of the energy sector, an estimated £200bn over the next decade in the UK alone. But policy makers are relying heavily on private capital to deliver key infrastructure such as replacement power stations, offshore transmission networks, interconnectors and gas storage facilities. As a result, access to capital is set to become a critical factor determining the evolution of energy markets this decade. A renewed credit crunch in Europe may well result in a full blown infrastructure investment hiatus, given energy companies are already targetting substantial reductions in investment capex. Companies may be forced to halt capex spend approval for new projects as well as placing existing development projects on hold. The projects most likely to survive are those which have very strong risk/reward profiles, such as natural monopoly infrastructure (eg transmission networks) and renewable generation projects with limited technology/planning risk and policy support protection (eg onshore wind). Investment spend is much more vulnerable for riskier projects such as offshore wind and gas storage, or projects with high upfront capex such as nuclear plant, pipelines and interconnectors. Investment in thermal power plant is likely to be a key factor shaping market dynamics. Building an investment case for new gas plant is already difficult given weak forward market margins. So capital constraints only increase the chances that new CCGT projects will be put on hold or cancelled. This may not be an imediate issue for power markets with a capacity overhang such as the Netherlands and Germany, but it is an issue for the UK power market. As important will be the impact of capital constraints on plant retirements and life extensions. The decision of plant owners to retire older gas and coal plant or undertake the investment spend required to keep them running is likely to be a key driver of power market dynamics this decade. The current environment of capital constraints and weak margins clearly increases the likelihood of retirements. However tightening capacity margins and the growth in ‘must run’ and intermittent renewable capacity, mean that older thermal plant will be increasingly important in providing system flexibility and determining market prices and volatility. Retirement of older capacity will not only reduce power market capacity margins, but it will increase market volatility and the value of flexibility of the thermal plant remaining on the system. Somewhat ironically, capital constraints may mean that energy companies retire the very assets that could be the prize of their portfolio in a few years time.